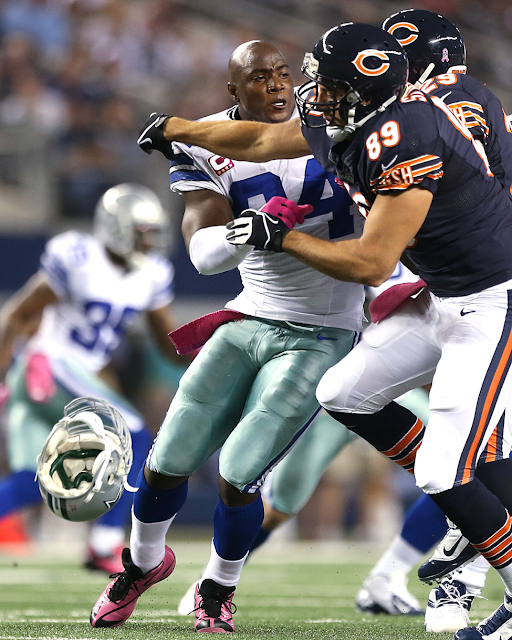 Tight end Matt Spaeth didn’t show up on the stat sheet on Monday night against the Cowboys. He didn’t even reel in a single catch, but he came up big all night long. Spaeth is in his sixth season in the NFL and he has made an impact as a blocker. He spent four seasons in Pittsburgh (07-10) before coming to the Bears last off-season. He filled in for injured fullback Evan Rodriguez as the lead blocker against Dallas. He also lined up in his usual spot on the line as a natural tight end. He did a great job at paving lanes for running backs Matt Forte and Michael Bush. Despite an injured ankle, Matt Forte was able to be successful and Spaeth lining up in front of him certainly helped. He helped out J’Marcus Webb and Gabe Carimi on both sides of the offensive line, helping to slow down the best pass rusher in the NFL. The offensive line allowed only two sacks on the night and one of those came in garbage time, the first came with Cutler holding onto the football for nearly five seconds. Spaeth was a big reason that the Bears protection up front was so good. J’Marcus Webb had a couple issues with DE DeMarcus Ware, but for the most part held his own. There were numerous plays that Spaeth held his own against Ware not allowing him to pressure Cutler. Despite a false start in the first quarter, Spaeth was almost flawless. Take away that forced fumble by Ware and the offensive line played its best game by far all season. Cutler completed 18 of 24 of his pass attempts. A big reason for that was the protection up front allowing Cutler ample time in the pocket, and the receivers were able to gain separation. At times, the Bears used backup guard Chris Spencer in the backfield as a lead blocker, while they used Matt Spaeth on the line as a tight end. Spaeth alongside fellow TE Kellen Davis did a solid job on Monday night. Despite the talent on the Cowboys defense, the Bears offensive line really made it easy for Cutler to complete passes with time and ease. Spaeth provided double team help for Webb and Carimi to protect the Cowboys pass rushers as well. Because of Spaeth’s performance he’s the unsung hero from the Bears Week Four 34-18 win in Dallas. The Bears should continue to use Spaeth both on the offensive line as a tight end and in the backfield as a fullback. He will continue to be an integral part of the Bears success in the battle of the trenches.